Venezuelan authorities claim to have uncovered the plot from a conversation between Guaido and Russian pranksters impersonating the president of Switzerland. Venezuelan authorities have alleged that self-proclaimed “Interim President” Juan Guaido and other opposition leaders were involved in a plot to carry out acts of terrorism employing foreign paramilitaries trained in Colombia. Venezuelan Communications Minister Jorge Rodriguez presented what he claimed to be evidence of “ultra-right plans to promote regime change.” According to Rodriguez, Venezuelan intelligence services uncovered plans to contract mercenaries from Colombia and Central America and bring them into Venezuela to execute targeted killings and acts of sabotage, adding that “at least half” of the armed groups managed to make their way into Venezuelan territory and are currently being sought. “We have identified some paramilitaries that have entered Venezuela, and we will search for them by land, sea and air,” Rodriguez told press. Juan Guaido’s chief of staff, Roberto Marrero, was arrested on Thursday, accused of leading a “terrorist cell.” Rodriguez claimed that Marrero was the link to to the hiring of Central American mercenaries. Rodriguez went on to reveal screen captures of Marrero’s phone purportedly showing Whatsapp group conversations featuring Marrero, Guaido, Leopoldo Lopez, currently under house arrest after being convicted for inciting violence in the 2014 street protests, among other opposition figures. Rodriguez pledged that more evidence will be divulged in the coming days. Rodriguez indicated that Venezuelan authorities had learned of the existence of the bank accounts after notorious Russian pranksters Vladimir ‘Vovan’ Kuznetsov and Alexei ‘Lexus’ Stolyarov called Guaido impersonating the president of Switzerland. The pranksters said they had identified funds belonging to President Nicolas Maduro they wished to transfer to Guaido, who readily provided the “president” with account information. Lawyer Juan Planchart was also reportedly detained on Sunday by Venezuela’s SEBIN intelligence services, and is reportedly being held at SEBIN’s facilities in Caracas’ Plaza Venezuela. Planchart was presented in the supposed Whatsapp conversations revealed by Rodriguez as a financial intermediary. At the time of writing there has been no official confirmation of Planchart’s arrest. 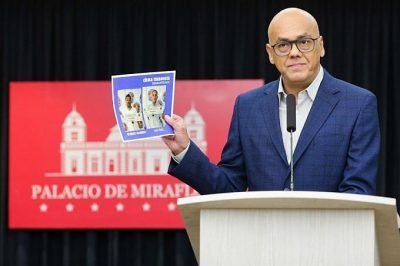 Venezuelan President Nicolas Maduro likewise divulged that a Colombian paramilitary leader, Wilfrido Torres Gomez, alias “Neco,” was captured in Carabobo State on Saturday. Jorge Rodriguez later claimed on Twitter that Torres was involved in the alleged opposition plans. US authorities reacted to Marrero’s arrest by imposing sanctions against three major Venezuelan public banks on Friday. The move followed sanctions against Venezuela’s mining sector and an oil embargo imposed in late January. There has been no reaction to the latest arrests from US officials or from Guaido and the Venezuelan opposition. Rodriguez’s revelations came as two Russian air force planes touched down at Venezuela’s Maiquetia airport on Sunday. According to reports, the planes carried equipment and around 100 servicemen, including General Vasily Tonkoshkurov, chief of staff of Russian ground forces. According to a source quoted by Sputnik, the deployment represents a fulfilment of “technical and military cooperation agreements.” The Venezuelan government has yet to issue a public statement. Russia had previously sent military aircraft to Venezuela in December as part of bilateral defense accords. US officials reacted to the latest development, with Secretary of State Mike Pompeo calling on Russia to “cease its unconstructive behavior” regarding Venezuela. Florida Senator Marco Rubio called the presence of Russian troops on Venezuelan soil a “direct threat” to US national security. Last week, US and Russian authorities held ad hoc talks on Venezuela in Rome, but no concrete agreement was reached.